This free extension send the new messages from review and contact form to Akismet which identifies and blocks comment and trackback spam. Our magento extensions helps you preventing spam on product review and contact form by using the Akismet web service to check if it's spam or not. If it is no spam you can moderate the messages in your magento backend. Magento spam killer without CAPTCHA! With our magento Akismet (Automattic Kismet (Akismet for short)) extension for magento no installation of CAPTCHA is needed. A CAPTCHA is not very user friendly and statics have shown that it can be cracked. Also you must not install something difficult on your magento front-end like a CAPTCHA. 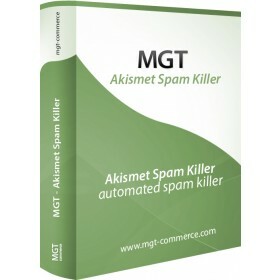 Here our „Akismet spam prevention for magento“ is the best solution to kill the spam. The smart code design of this extension reduce the size of your database entries and all spam messages are saved direct into a local text file. Akismet is the biggest web service which is trusted by millions of WordPress blogs to help preventing for spam comments and trackbacks by automatically detection. Every time you get a new review or contact message on you magento shop we submit this first to the web service of Akismet which makes hundreds of different tests to prove if it is spam or not. 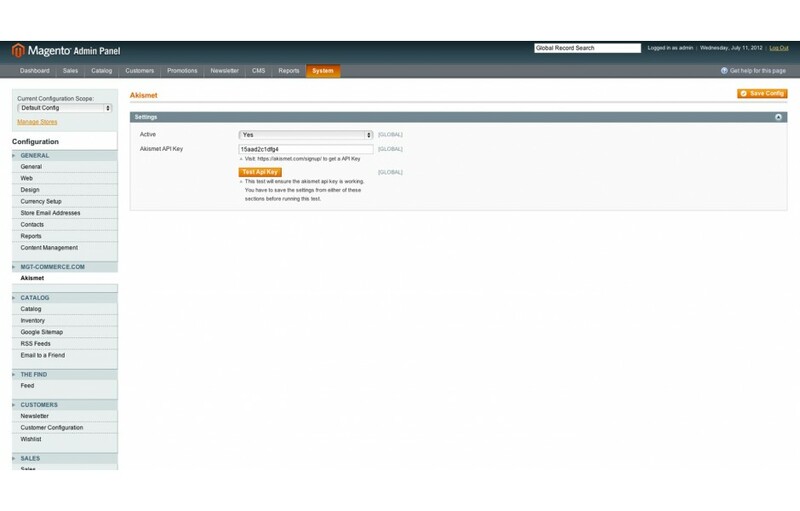 The result is that you don´t waste your time by moderating and deleting spam in your magento backend. How to get Akismet API key? Important note: We recommend to spend a bit to help this great service paying there servers and developers, its a great service! Works as advertised! Easy to install and the spam has stopped! We were getting 2000+ spam reviews a day, so finding and installing this extension was a huge blessing for us. Great and easy to install. Does exactly what it promises. We were getting 60-80 spam reviews per day. Now we get zero. Perfect. Enjoy! After installing this extension, the Spam mails from Contact form stopped. Now i am trying to implement the Filter to a custom form in my Site. This product has been spectacular. It has eliminated the hundreds of spam reviews that my site was receiving every day. Now I can be sure to allow reviews by real people rather than ignoring them all. Thanks MGT! This product is very useful for spam review. It used to take us a lot of time going through all customer reviews which included hundreds of spam messages every day. Ever since we installed Spam Killer all spam messages were eliminated. Great Product! Thanks! We were having a problems with spam comments to the level of several hundred a day. Added this and have not seen once since. Recommended! This is a must have plugin for magento. I haven't received a spam contact form since I installed it. After wading through 100's of spam entries every single day, we went in search of app to address this tedious problem. It worked! Not ONE piece of spam has gotten past this "killer" app. Worth every penny it doesn't even cost! if you get review spam - get this extension. I was glad I chose installing this extension. This piece of code works really well. With the well proven Askimet solution in the background, it really helps to protect your shop from spam. Works brilliant into our company e-commerce site. We were facing trouble from spammers, they were sending bulk of emails into our sales inbox. Once i installed MGT Akismet Spam Killer it was magic all stopped adhoc. Thanks to MGT for this functional plug-in. Didn't face any trouble in installed at all. Also you can check into your log file, that how much Akismet stop everyday. We recently picked up the free extension "Spam Killer" from Mgt-Commerce and were surprised how easy the set-up and configuration was. Within 10 minutes we were up and running and so far it seems to block 99% of our questionable reviews. We highly recommend! Works like a charm ! Thank you ! This is certainly the best value when it comes will protect against spam on websites and webshops, mainly made ​​with magento stores. This extension is ideal for stopping comment spam via reviews - works perfect. Dead MGT, Your extension works great from the start to end on magento 1.7. Thank You Sucess. Very useful. I recommend for those where spam kill your app. What more can an IT admin want? It works. Product is great! Installation of extension was easy. Plugged in the Akismet key and that was that. Goodbye spam! this extension really reduces the spam, good! This is the best spam filtering tool I ever found. Thank you so much. This tool is awesome! I cant believe that its free! This tool is totally awesome, we where getting spammed every day with all sorts of nonsense. I don't really even understand why folks make bots to send that junk but Spam Killer solved the problem perfectly. I was going through the process of adding recaptcha and had done a few hours work to get it up and running. Then I found this, it took seconds to install and i dropped captcha completely. Thanks a lot mgt-commerce. I will be checking your site from now on to look at potential tools for all my magento stores! We were getting about 200 spam comments a week. This product has blocked almost all of them. Definitely has reduced the workload! I had a spammer/bot sending one spam email per day through my magento contact form to the site's owner. The site owner's mail server was recognizing it as spam and bouncing it back to my server. This had the potential to give my server a bad name as a spam sender. I installed Spam killer, created an Askimet account (had done this before for Wordpress sites), then tested with the content from some of the bounced spams. Askimet recognised every one as spam and refused to send them. Awesome! I have received no more bounced spam messages from my web site client's mail server for 4 weeks since installing Spam Killer. Human users of the contact form receive the same smooth Contact Form experience as they did before I installed the Spam Killer. Spam Killer solved my spam problem with no negative side effects, and its free. We were getting (literally) 2 to 3,000 spam reviews a day - we now get 1 to 2 legitimate reviews that we have to sort through every couple hours, NO spam so far since installing. Couldn't be happier. Works out of the box but my site isn't live yet so I have it disabled for now as but I'm sure it works great, then I can write a more accurate review. This should standard for every magento shop. Thank you very much and continue this awesome work. this extension is easy to install and it works without any issue. 5 stars! We searched for a good spam-filter, and here we found the the best solution in your shop, thank you! I have searched a long time for a extension which help me preventing my magento shop for spam! Excellent work!